Playing with scale is a fun side of photography that can bring a new dimension to your image. This concept is nothing new, after all we have all seen those cringe-worthy tourist pics where they pretend to hold up the Leaning Tower of Pisa with their hand... you know the ones. More recently this concept has had a fresh life breathed into it thanks to innovative Instagrammers like Dominique from @allthatisshe and Danielle from @sienna.and.I who have taken this play on scale to the next level by cleverly collaging their images. 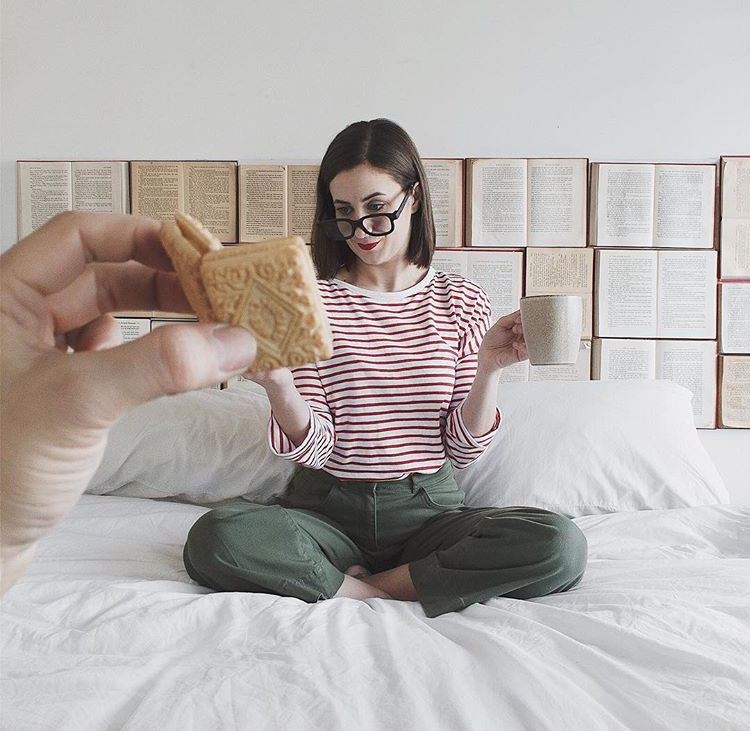 Instagrammers now experiment with scale as a fun [and often very humorous] styling and editing technique bringing an element of unrealism to their images. Check out the Instagram hashtag #objectsforoutfits for more examples and inspiration. Anyone that has attempted to take a photo like this will know there is just one catch - it is impossible to have both your foreground item and background subject in sharp focus at the same time. Plus ensuring that both are perfectly aligned to get that perfect snapshot would take more patience than all the Instagram husbands in the world have combined. This means you'll need the photograph each element separately and the means to combine the two images together. I thought I would try my hand at collaging this week and discovered it's is easier than you might think. Here is an simple smartphone tutorial on how I created the simple announcement pic collage for this week's 'little and large' challenge with Tiny Sprout. Basically just your smartphone! Although I did take the original photos on my camera there is no reason why you couldn't use just your phone. Brainstorm an idea for your collage and photograph your subject matter. 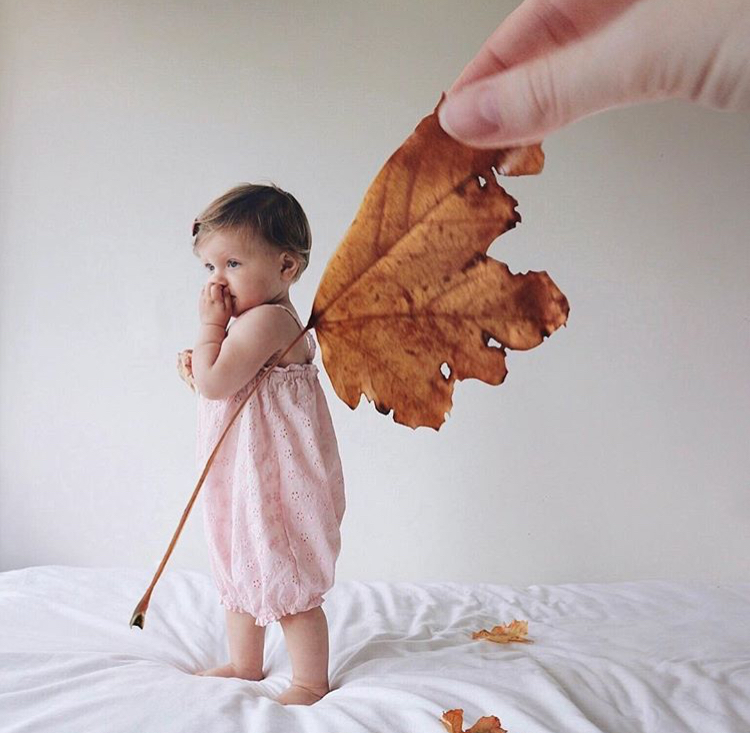 You can use anything from leaves to food...the possibilities are literally endless and you are only limited by your imagination! Tip: Try to photograph the object in similar light conditions to your background image and against a plain backdrop like a white wall. This will make the object easy to edit in the following steps and the end collage more cohesive. My original photos were very simply edited in Lightroom [PC]. This is certainly not necessary...smart phones are pretty amazing and these apps are easily assessable to everyone and super easy to use! You can use your camera on your phone and apps like Lightroom [mobile version] Snapseed or VSCO to edit your images. Import image 1 to the Magic Eraser app and crop the photo if required. This is the image of the object you want to be at the foreground of your final image. In this case it's my daughter's rattle, Lessa Lamb from Tiny Sprout. You can now manually fix the areas you want to be transparent by using the 'Erase' tool and restore areas of your object that may have disappeared by using the 'Restore' tool. These are the next two tools to the right of the 'Magic Wand'. I found this the most time-consuming step but definitely worth it for the end result. Tip: Make sure you are very thorough with the 'Erase' and 'Restore' tools because the 'Magic Wand' doesn't always pick up all the background and this can affect the quality of your end image. Once you are happy with the parts of the image you wish to erase, select the export button in the top righthand corner. You will then be asked to 'Save Photo As'. This is where you can choose to put in your background image by selecting 'Edit Background'. Select 'Photo' and import your second image. Your background image will appear behind your object in are the area you just erased. You can then move and scale your object to the position and size you want it to be in relation to your background image. Once you have the positioning perfect, you can press save and your collage is created! I then imported the image into Snapseed and played with some simple edits like selective brightness and the structure of the completed collage. This step isn't completely necessary but this will help make the two images more cohesive if needed. You can also use other apps such as VSCO and Lightroom for this step. Post on Instagram using the hashtag #CS_LittleAndLarge and tag @CreativelySquared and @TinySproutKids. See...too easy. I can't wait to see what you all come up with!